Over the past few weeks, blogs and Pinterest boards have been abuzz with posts about natural egg dyeing. After we dyed our eggs with beets, paprika, turmeric, and red cabbage, it seemed wasteful to dump the extra dye down the drain. I took a handful of un-dyed wool and put it in the yellow (turmeric) dye, then went grocery shopping. When I came home, I found that the wool had, indeed, dyed a beautiful yellow. I saved the rest of the yellow dye (having dumped the others because they were a bit lumpy) and decided I would try more later. I boiled two pots of water: one for turmeric and one for paprika. Each pot had enough water to cover the yarn. I added a few teaspoons of spice for each liter of water and one tablespoon of vinegar to each pot. It definitely takes a lot paprika to make a darker color, but turmeric will work with less. I mixed the spices in well then let the water come to a boil. I then submerged the yarn in the dye and turned the temperature to low, leaving the dye to simmer for about 30 minutes. You could make your yarn darker or lighter by changing the amount of spice you use or changing the length of time you leave it sitting. Remove your yarn when it is several shades darker than what you would like. I used tongs to remove the yarn from the dye. Wearing rubber gloves, I washed the yarn until no more dye came out. I set the yarn to dry in the sun. I covered the pot of dye with a nylon stocking and poured the dye into another pan, trying to avoid letting any of the spice mix in. This is because I did not want any spices to stick to the wool which is much more delicate and harder to wash than the cotton. Once the dye had cooled to about the temperature of bath water, I carefully submerged the wool. Next time, I will take greater precautions to fully submerge it. Again, I let the wool sit for about 30 minutes. After washing, I found that this was far too short! Next time, I will leave it for at least an hour, if not several. After soaking, I carefully washed the wool. The water should be luke warm--no warmer, no colder. This prevents the wool from accidentally felting. After the water ran clean, I set the wool to dry in the sun. The results! 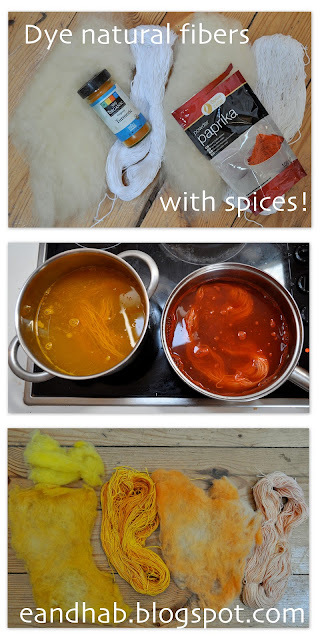 Turmeric turned both the wool and the cotton a pretty bright yellow. The paprika made the wool a pale orange and the cotton a coral pink. I will be using the wool for needle-felting, not for wet-felting, because I do not know how well the dye will stand up to washing. As for the cotton yarn, I will probably be using it to make brooches or accessories--again, things that do not require washing. Want to dye other colors? Try the same techniques used for dyeing Easter eggs (this link has a good explanation of different colors you can make)! Who sells 365 brand spices in Praha?? Don't tell me whole foods invaded! Haha, nope, no Whole Foods invasion. Turmeric is one of my favorite spices, which I cannot find here, so I had it imported. When I tried paprika (on premordated wool) it was not light fast at all, the yarn turned as white as it started after only a few days in the open. Did you have the same experience? Came across your blog from Pinterest. May I know if the vinegar is for fixing the color? Can I use it for any spice or natural dye agent? Thank you. Thank you for your interest and input! We get embarrassingly excited to receive comments. Elephants and Hot Air Balloons is a blog by two crafty young ladies who travel a lot. After living in Prague, they are wandering around the United States, looking for a place to stay for a while. Sometimes they go on adventures. Wherever they are, great things happen.